Go for the Goat at Tar & Roses! Tar & Roses in Santa Monica has been open for more than two years now. I remember the first time I ate there, when it first opened, and watched a group of friends enjoy a hedonistic meals of sorts. When a large platter of meat was presented to them, I asked our server what they ordered as I wanted it as well! We were told that it was the Wood Fired Goat Dinner, good for groups of 4 or more and must be reserved at least 7 days in advance. Ever since then, it has been on my list of must-eats. So, when a friend called me recently to tell me he had an extra seat at the table for a Wood Fired Goat Dinner, I quickly accepted. 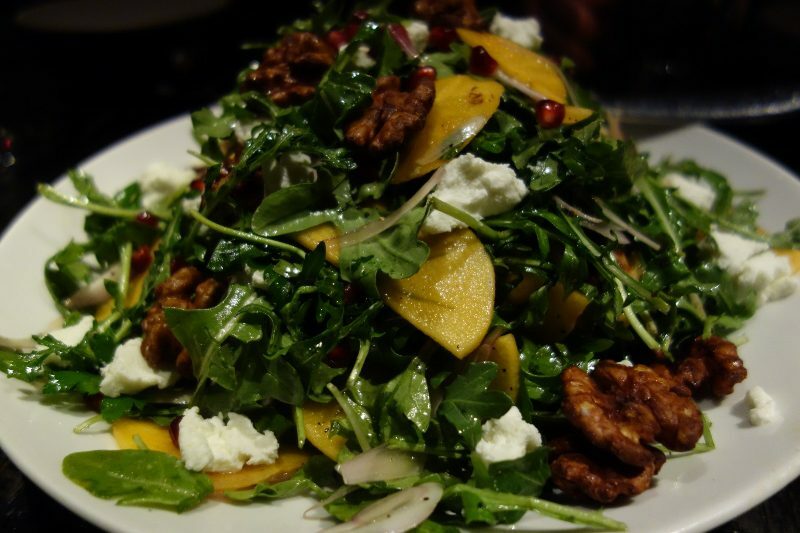 Persimmon Salad with pomegranate seeds, goat cheese, arugula, red onion and candied walnuts – I loved the combination of the ingredients and the dressing was just enough, this was a light, refreshing dish to start with. 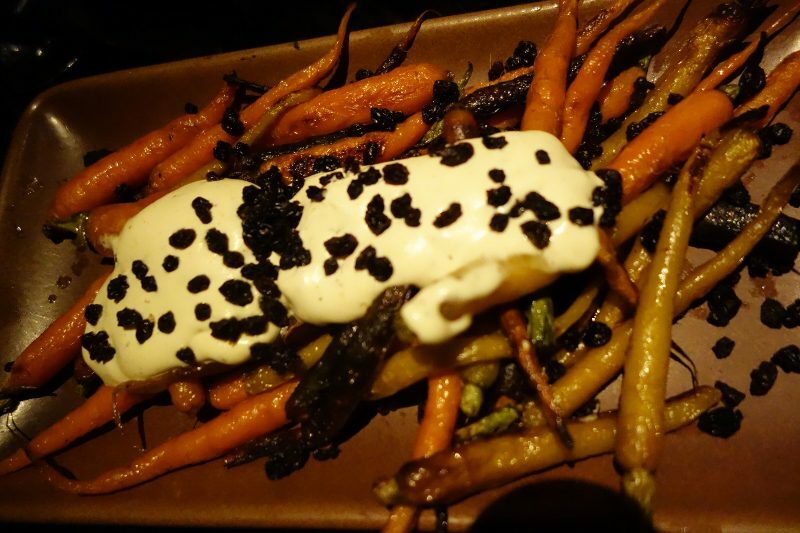 The Roasted baby carrots topped with currants and a chermoula creme fraiche were sweet and crunchy and we didn’t miss a drop of the chermoula creme fraiche. 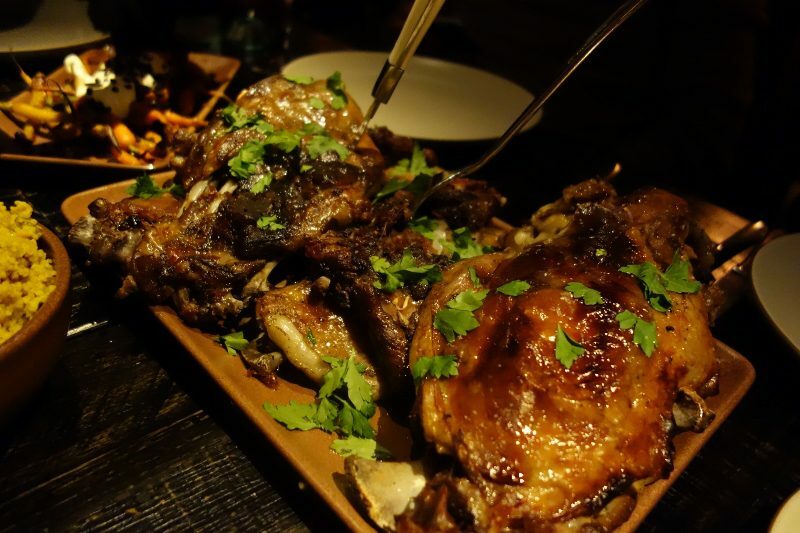 The main dish – Wood Fired Goat – was tender and flavorful. 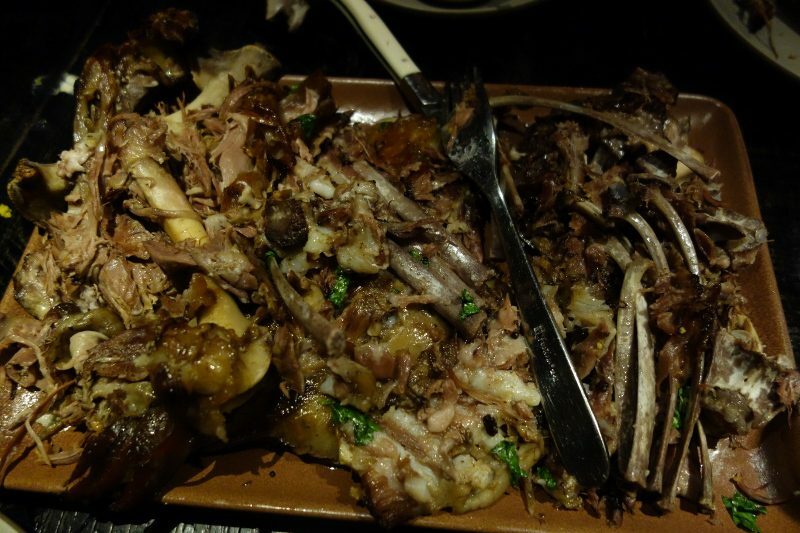 A crispy, caramelized skin, the meat literally fell off the bone. Saffron-scented cous cous was the perfect pairing for the goat. Trio of Accouterments (pickled tomatoes, banana raita, and harissa) were also served with the goat; the banana raita was a particular favorite. We managed to make our way through the goat. No matter how full we got, we couldn’t stop eating it, it was so good. Of course, we made room for dessert and so glad we did. The Strawberry Ricotta Crostata, served with honeycomb ice cream, might very well be one of my favorite desserts of all time. 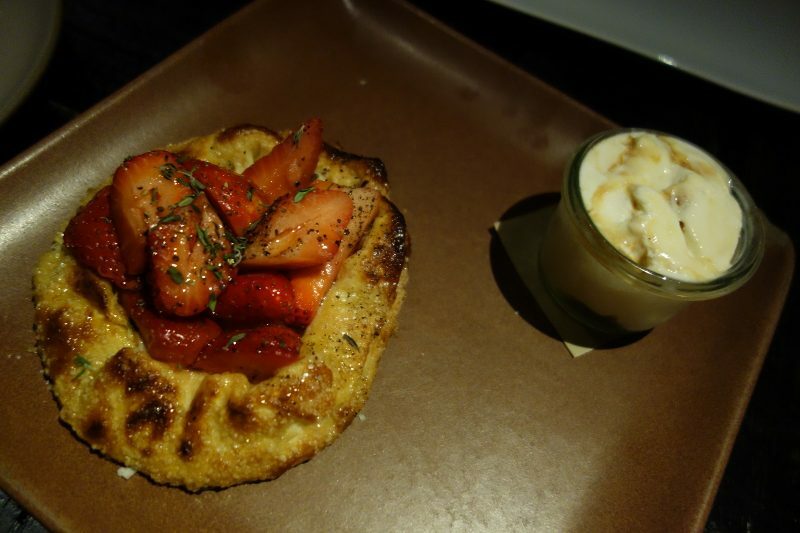 From the golden crispy crust to the fresh strawberries and ice cream, it was a perfectly harmonious dish. The Chocolate “Tar Bar” was served with salted caramel ice cream and toasted hazelnuts was rich and a great balance of sweet and salt. This is a dish to please any chocolate lover. This entry was posted in Food and tagged Chocolate Tar Bar, Saffron-scented cous cous, Santa Monica, Strawberry Ricotta Crostata, T&R Suppers, Tar & Roses, Wood Fired Goat, Wood Fired Goat Dinner by Allison Levine.